Please click the markers on the map to learn more about each destination on our wildlife adventure tours. To the left of the title “World of Grizzly Bear Lodge and Safari” click on the little “arrow” and then scroll down to the bottom and to the left of “Made with Google My Maps” click on the “Green Box”. This changes the map to the Google Earth / satellite View. Place your cursor over the “Blue Teardrop” to the right, the one near “Glendale Cove”. Zoom in using your cursor or the “+” and keep the right end of “Tom Brown Lake” in the center of the page. Focus on the zig-zag man made spawning channel. As you get closer you will see a small weir / dam which regulates the salmon into the spawning channel. The stretch of water below the dam is the holding pool for the salmon. The roof of each viewing platforms is visible. One is near the weir and one at the other end of the holding pool. Leave Campbell River, on Vancouver Island, late afternoon in your float plane. Enjoy the view of the Coast Mountains, channels and fjords as they pass below. Land at Sailcone’s Grizzly Bear Lodge on Minstrel Island, the center of the Knight Inlet wilderness area. 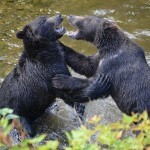 Get settled in, relax, tide permitting – set out on a short local trip to view Black Bear feeding on the beach. 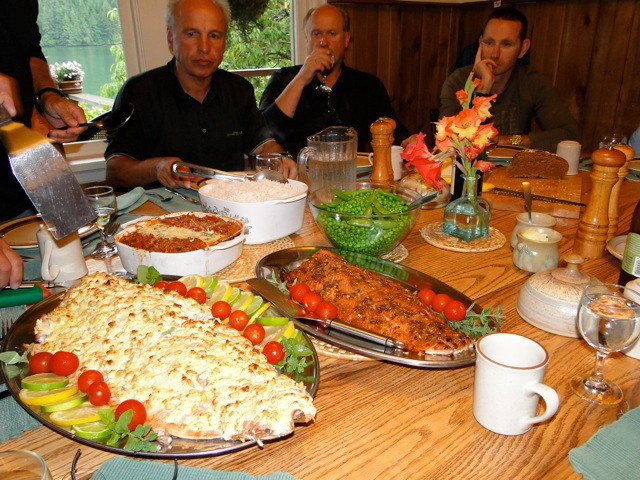 Return to the lodge and enjoy a delicious dinner and learn some background on the wildlife of the area. Off to bed. Rise early. Coffee and breakfast and into your boat. 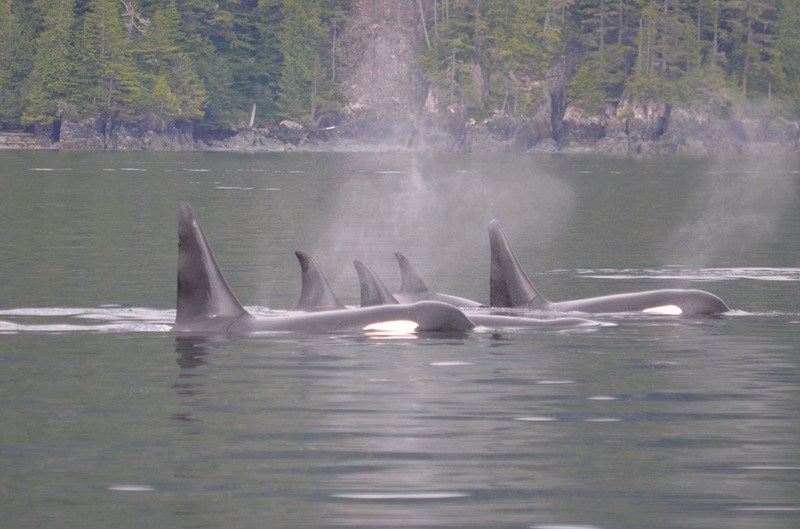 You are off to Johnstone Strait, the summering grounds of the Orca [Killer Whale]. 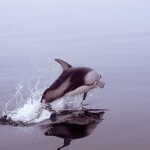 Cruise the area observing pods of these magnificent mammals. 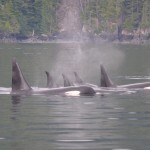 In our area we are lucky to have both the transient (mammal feeding) and resident (fish eating) Orca. 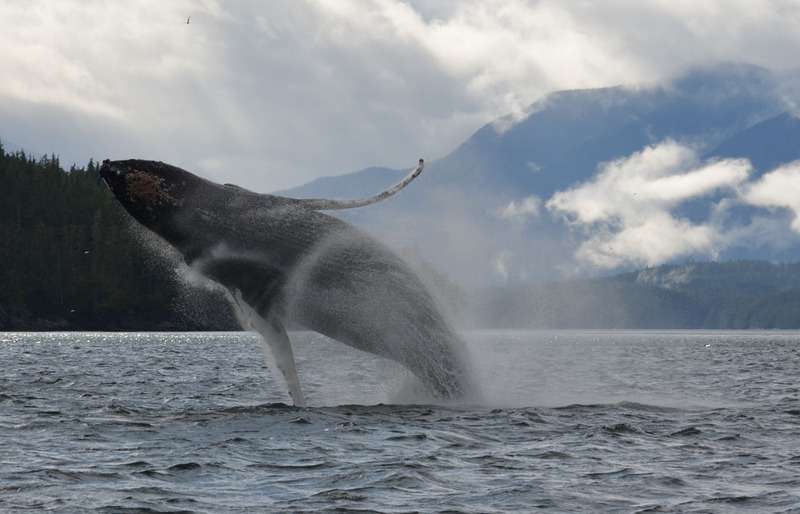 Humpback whales are abundant and with a little luck they have been known to put on some spectacular shows for our lucky guests. 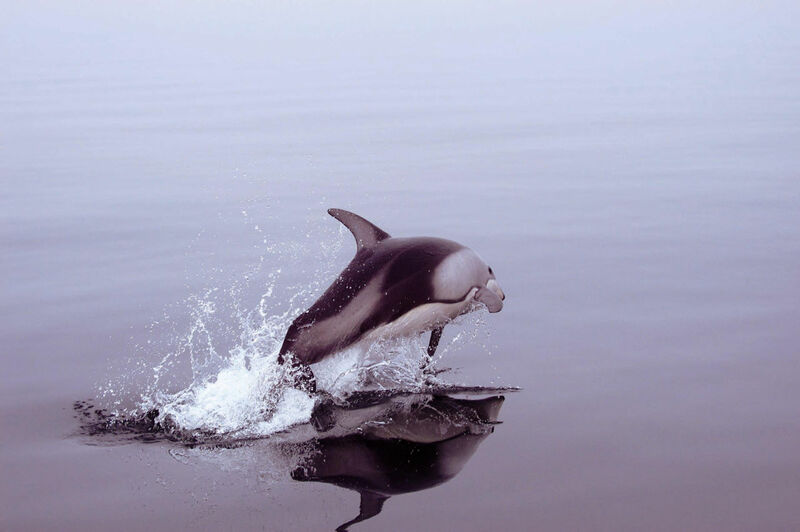 Besides the whales the strait is alive with Stellar Sea Lions, Harbour Seals, White Sided Dolphins, Dalls Porpoise and an abundance of bird life including countless bald eagles. 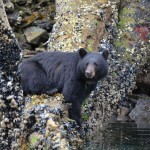 On the trip to and from the whale watching area Black Bears can often bee seen feeding on the beach. 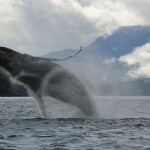 Our whale watching trips take place on inside waters, away from the open ocean swells. In the summer it is often flat calm for much of the day. After a beach lunch or boat picnic there is more exploring and wildlife viewing and then back to the lodge for a hearty dinner. Rise early. After coffee and breakfast you are off to your boat with your guide. 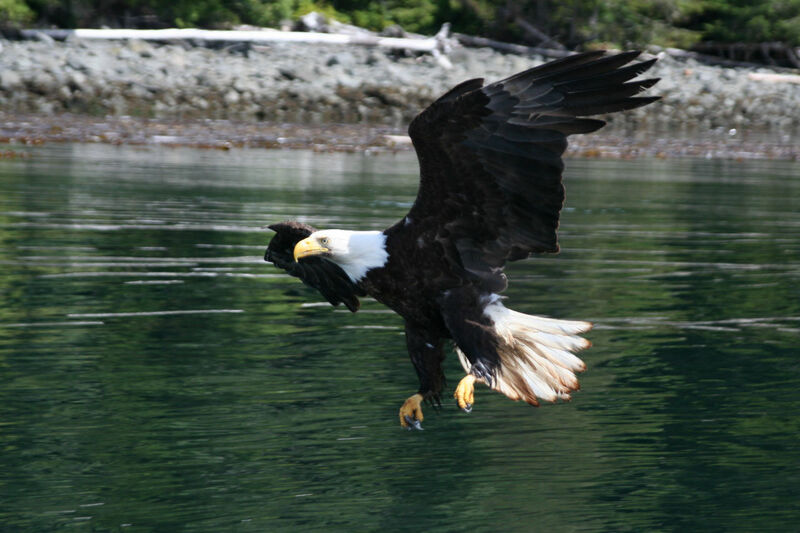 Travel the shores of Knight Inlet, a spectacular scenic fjord, to Glendale Cove where you ride our Grizzly Bus [Aug 25-Oct15] up to the salmon spawning channel. 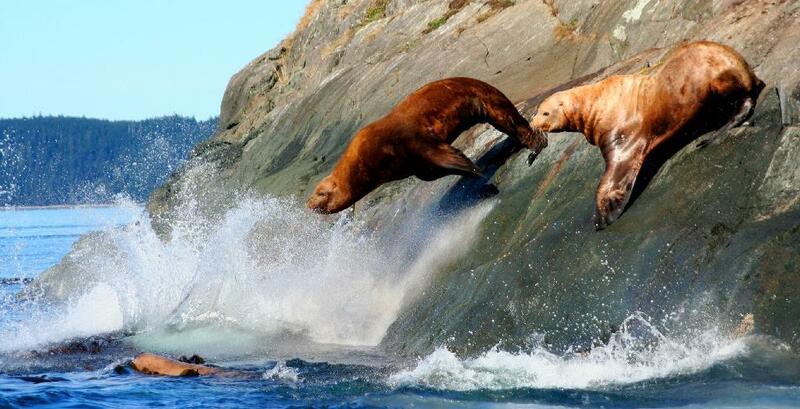 Here you can photo huge Grizzly Bears as they feed on these fish using dives, scoops and plunges to trap their prey. Observe two hours from our viewing stand and then back to the boat for lunch and more Grizzly Bear viewing at the Glendale River estuary. 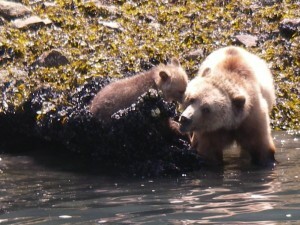 Trips before August 25 view the grizzly bears interacting and feeding in the estuary and on the beaches near the river. 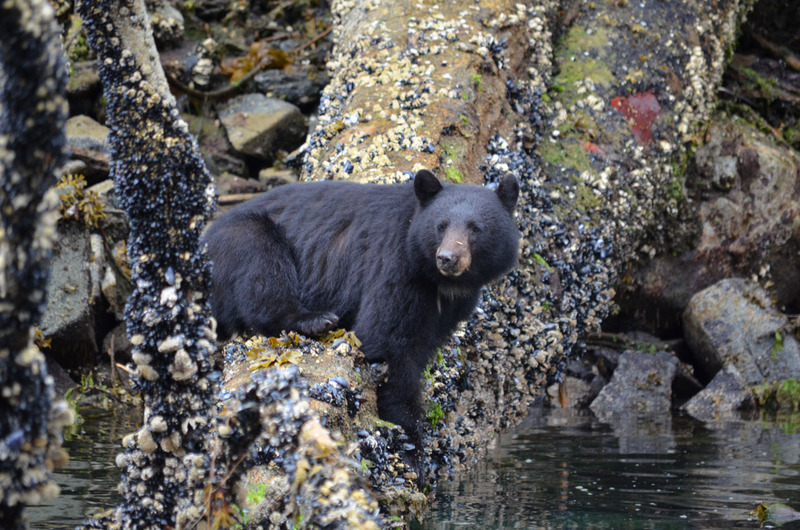 We view the bears from a flat bottom viewing boat which allows us to enter the shallow waters of the estuary and lower river. (Day 3 Itinerary continued below). 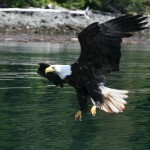 Cruise Knight Inlet home to Sailcone’s Grizzly Bear Lodge to meet your late afternoon plane back to Campbell River where you will stay at your pre-chosen hotel. 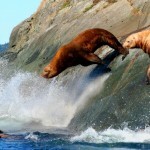 Sometimes we change the order of the viewing days to accommodate better Grizzly Bear or Whale viewing. Finally, weather can effect the quality of viewing. Thank you for your hospitality. It has been a great stay with great food, wonderful nature and spectacular animals and sceneries. 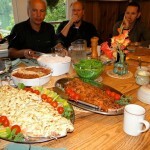 We will recommend your lodge to everyone we meet and will try to come back. Two of the best days Steve and I have had. Great food, great place, great staff. Thanks to all! Thank you so much for the great trip. We loved the Lodge, the people and the bears and whales. It was a wonderful experience. In human terms we would like to think that this photo shows a love bond between mother and cub although this may be true in this case the cub wanted to nurse. 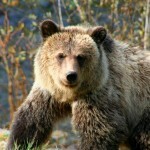 Grizzly cubs generally stay with their mother for two years; some will stay for three or four if she does not become pregnant in the fall of their second year. 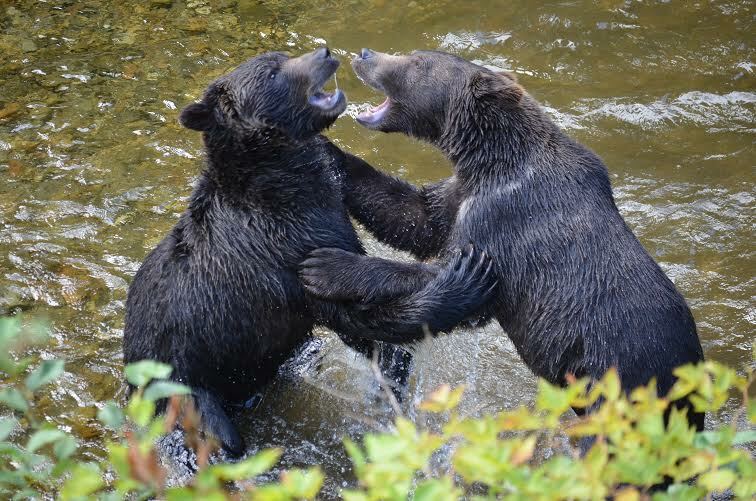 Grizzly bear are extremely good mothers, and, consistent with the high level of “investment” they make in their cubs to ensure their survival, they are very protective of them. 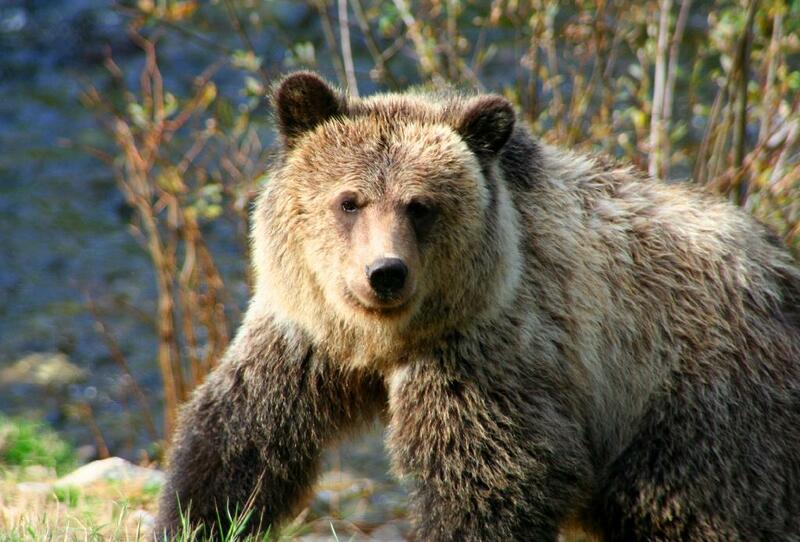 Because of this, encountering a grizzly bear with young can be very dangerous. During the first two years of their lives, the sow will teach her cubs everything they need to know to survive on their own. She will school them in finding and exploiting different food sources, and the cubs spend significant time observing her actions and learning them for themselves.